returns to Nigeria for the second year running with the Youth Diploma 1 course for coaches in Nigeria, has received the support of the Lagos State Football Association. The professional certificate course will be held from July 6-8, in Abuja, at the Premier International school and Lagos Preparatory School, Ikoyi, will host the Lagos leg of the course from July 10-12. 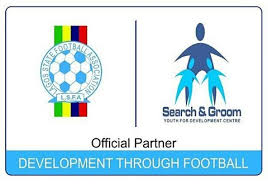 In a statement released by Yomi Kuku, Executive Director, Search and Groom youth for development centre; representatives of COERVER COACHING in Nigeria expressed readiness for the event. “In cooperation with the Lagos State Football Association (LSFA); under the “development through football” partnership status, there is a greater consideration for the 2017 training course to be held within the schools environment as we go into the next phase of our strategy to work with schools to officially adopt the COERVER COACHING method as a learning tool during extra-curricular activities,” he said. Kuku added that the Technical Director and CEO of COERVER COACHING Netherlands, Rainel Woerdings will be leading the coaching team to Nigeria. Lagos State Football Association Chairman and First Vice President of the Nigeria Football Federation, Barrister Seyi Akinwunmi has implored grassroots coaches to take the advantage of this huge opportunity right at their doorstep by registering to participate in order to build their own capacity to be able to function more technically and proficiently. Chief Operating Officer of COERVER COACHING, Mike Smith, is exciteed at seeing “Coerver® Coaching return to Nigeria after the first ever training course, in 2016. Mike said “Our Youth Diploma 1 course has been delivered in over 30 countries and has won acclaim from grass-roots and professional coaches alike for its innovative, practical material and the results that come afterwards in the development of skill, confidence and creativity in coaches and their players. There is clearly potential to significantly improve the football experience for young people across Nigeria, and it all starts with developing better coaches”. Coerver® Coaching is based on the innovative principles created by Wiel Coerver formed in 1984 by Alf Galustian and former Chelsea great, Charlie Cooke, who were given exclusive rights to develop and expand the Coerver® Method worldwide.